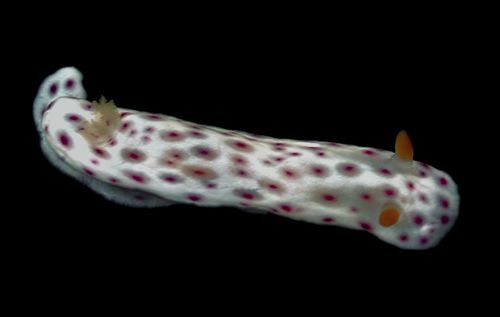 Identification: This dorid is elongate with a white body and foot covered with magenta spots, most surrounded by a translucent ring. The rhinophores are yellow-orange and the gills vary from pale yellow to orange. Natural history: Chromodoris aspersa is a commonly seen nocturnal species that may be found under rocks during the day. It occurs from the low intertidal to 37 m (120 ft) on rocky bottoms in protected to exposed locations. This is one of the Chromodoris species that deposits its eggs with the ribbon attached by its side rather than its edge (Scott Johnson, pers. com.). It probably feeds on a thin, orange-red sponge. Distribution: Big Island, Maui, Oahu, Kauai, French Frigate Shoals and Kure: widely distributed in the Indo-Pacific. Taxonomic notes: This species was listed as Chromodoris lilacina (Gould, 1852) in Kay, 1979, Kay & Young, 1969 and Bertsch & Johnson, 1981. The name means "sprinkled." It is referred to as the "purple-spotted nudibranch" in Hoover, 1998 and the "lilac-spotted nudibranch" in Hoover, 2006. It may have been first reported from Hawaii in Kay & Young, 1969. Photo: PF: 19 mm: Makena Landing, Maui; May 11, 2008.